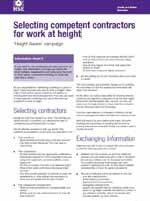 Selecting competent contractors for work at height will show on screen for download and we will email you a copy. HSE - Selecting competent contractors for work at height. competent to work at height. competence you will expect them to have. contractor is competent to do the work you need them to do.